Shipping nationwide.... If you need it shipped just let us know! In an attempt to better serve our customers Standing Bear's Trading Post conducts all ordering via phone and e-mail. Chrome-plated knife adjusts to a custom fit. Includes 3/8" straight blade. in two popular sizes to cover a wide variety of carving. 1/4" (6 mm) wide-angle detail blade. 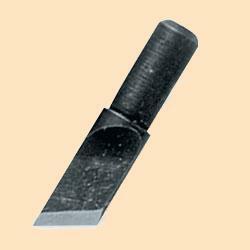 This swivel knife blade is a great blade for general figure carving. Super sharp ceramic easily glides through tooling leathers. Never needs sharpening---just strop! 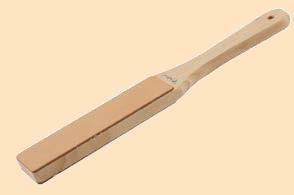 Rub on the flesh side of leather for a fine polishing strop. 1/8 lb. 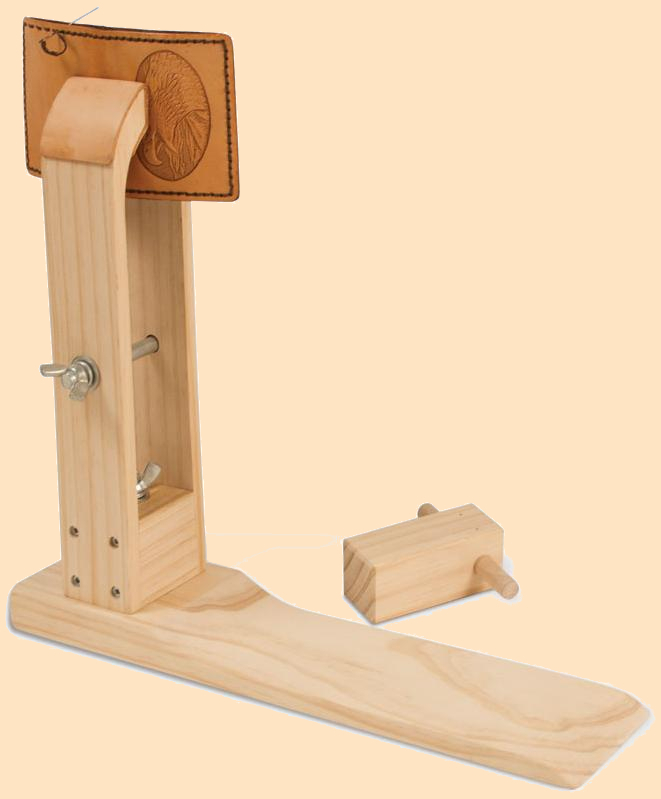 The wood is 10-3/4" with 5-1/2" x 1-5/8" (140 x 41 mm) leather strops on each side. 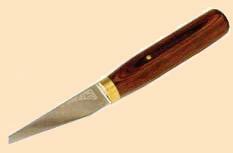 Al Stohlman's name has always stood for the best and this round knife continues that tradition. The 4-3/8" stainless steel blade is cast and polished to a mirror-like finish. It will easily glide through thick leathers like saddle skirting. It has a solid brass bolster and the hardwood handle is a work of art. Our very best. with a 4" (102 mm) handle. Master craftsman knife set, Custom turned 3-3/4" walnut handle, solid brass jaws and ferrule for years of durable use. Includes 9 blade (5/16" x 2-1/4" deep curve, 7/8" radius, narrow point) and 11 blade (5/16" x 2-1/4" straight grind on slanted edge). Measures 5/16" x 2-1/4" deep curve, 7/8" radius, narrow point. 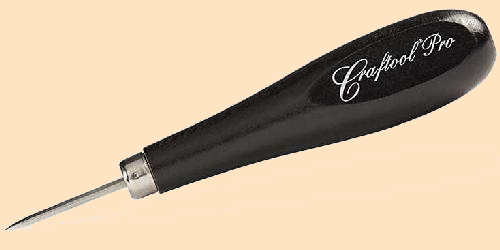 Contoured handle design with soft cushion for comfortable holding. Strip cutter, chrome plated cast steel with brass parts. Adjusts to cut leather lace, thongs and strips up to 1/2" wide. Leather scissors, pro shears, cuts up to 10 oz. leathers. A sharp serrated edge and easy grip, vinyl handles on these shears make them a craftsman dream. Works great at cutting all different weights of leather. Can easily adjust to cut 1/8" to 4" strips. 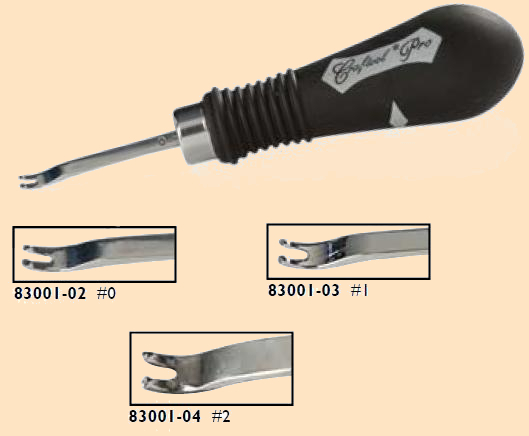 Replacement blades for the following tools-307000 Strip Ease, 308000 Strap Cutter, and 307900 Pro Strap Cutter. Professional model tool with aluminum handle for cutting strips up to 4" wide. Polished head and pre-marked measurements on slide. Replacement blade for 308400 Craftool Draw Gauge. This time saving tool will Cut your own lace, fringe, belts and braiding strips. This item was formerly called a "jerry stripper" Cuts in multiples of 1/8" up to 3" wide. Works best on firmer 3 to 5 oz. leathers. Turn scraps into lace! Turns a 4 inch circle of leather into 8 feet of lace. Replacement blades for the following tools: 302500 Super Skiver, 300100 Safety Beveler, 378400 Lace Maker. adjust the guide to the desired width and you are ready to use. Tool will adjust from 1/8" to 1-1/2"
Swivel knife blade not included. and ready for immediate use. Easy to use for both left and right-handers. 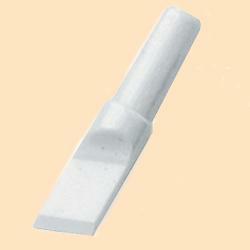 Gouge, skives and channels up to 1/4" wide. Skives most thicknesses of leather without cutting too deeply. Includes one blade. 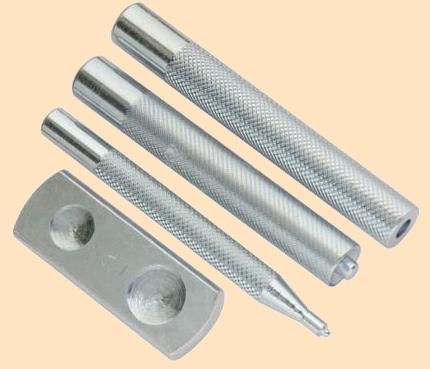 4-1/2" long ballpoint stylus, for transferring tracing patterns to tooling leather. Fine/Small Round Spoon for figure carving and to smooth beveling marks. Ergonomically designed to provide more comfort and better control. 6" long. Medium/Large Round Spoon for figure carving and to smooth beveling marks. Medium/Large Pointed Spoon for figure carving and to smooth beveling marks. Small/Large Ball is the perfect tool for embossing. Small/Large Undercut is for beveling and outlining. Point/Stylus works for all your transfer needs. Made of water buffalo rawhide on a contoured wooden handle. 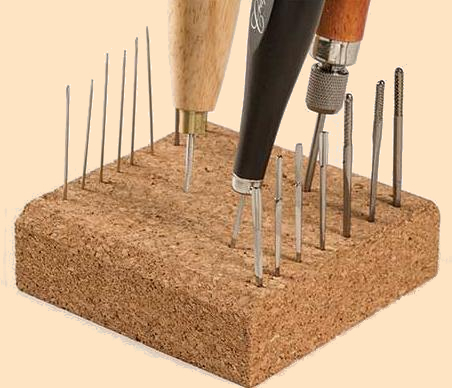 Polymer heads resist wear and protect your tools, too! Medium mallet head size is 3-3/8" x 1-3/4". Large mallet head size is 3-3/8" x 2-1-8". 9" handle with 1 1/2" x 4" head. 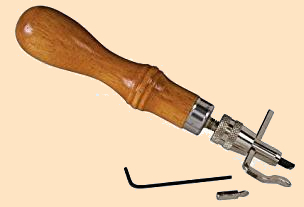 This style of hammer can be used to assist in folding and creasing leather during assembly. 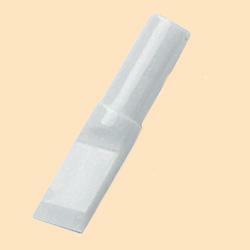 Its rounded, polished face prevents any marring of the leather. 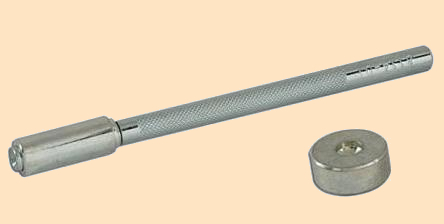 This hammer like any other metal hammer should NEVER be used with your leather stamps or punches as it will damage your tools. 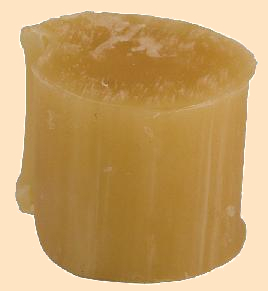 Length of head 4-1/2" diameter of face 1-1/4" length of handle 4-7/8"
Round and tapered mauls are 9-3/4" long. The flat head mallet is 7-3/4" long. 35062-02 Tapered Head 2 lb. 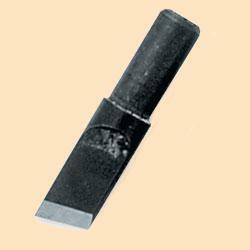 35061-01 Flat Head 1 lb. shock and fatigue when working for long periods on leathercraft projects. Length is 9-3/4" long.16 oz. Poly/Poundo Board when using leather punches. Color could vary. Measures 12" x 12" x 1-3/16"
For parallel lines, inside borders, decorative work and more. Adjusts quickly from a fine line to 5/16" wide. Measure right angles quickly and accurately. Ideal for laying out patterns. 12" x 8". 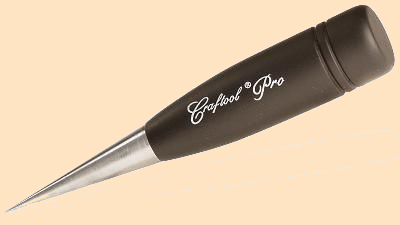 Functions as a small creaser, large creaser, folder, edge burnisher, and slicking stick. 6" x 3/4". 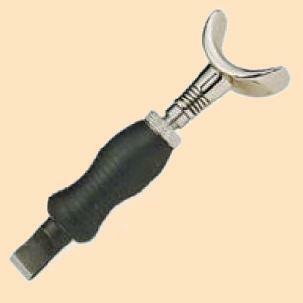 2-1/8" diameter nylon tool gives leather smooth, finished edges. Works quickly and easily. 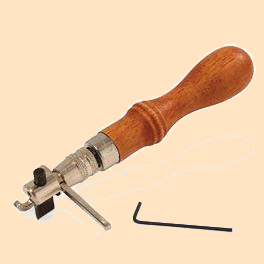 tool can be used for pushing out leather when doing carving with embossing. 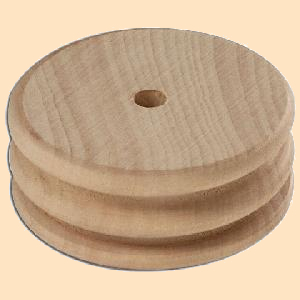 These 2" diameter slickers for burnishing a smooth polished edge on your projects. Use by hand or adapt to an electric drill for faster results. Bevels and rounds off edges of leather. Available in five sizes. The larger the number, the wider the bevel. A true belt maker's favorite. Excellent for trimming and rounding edges. Size 2 for lightweight leather. A true belt maker's favorite. Excellent for trimming and rounding edges. Size 3 for medium weight leather. 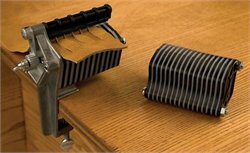 A true belt maker's favorite.Excellent for trimming and rounding edges. Size 4 for heavyweight leather. 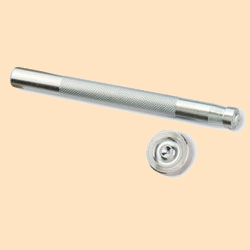 One handle, 3 interchangeable spacing/overstitch wheels and a small screwdriver make this a handy addition to your tool collection. 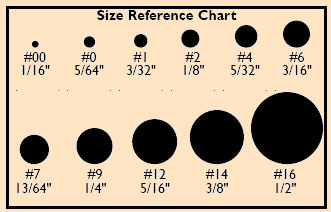 Wheel sizes are 5, 6 and 7 holes per inch. 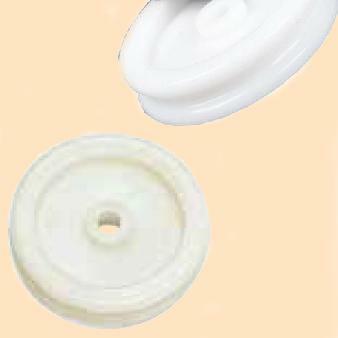 Embossing Wheels ~ 1/4" Wheels designed to fit overstitch and embossing wheel handle 8091-00 (sold seperately) These wheels are listed individually below. Great for fast and easy borders! 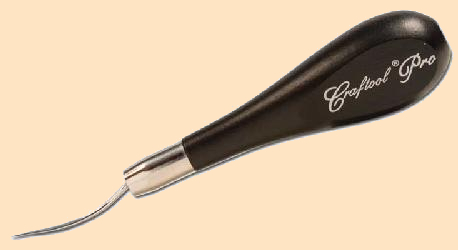 For use on cased vegetable tanned leather.1/4" wheels designed to fit Overstitch and Embossing Wheel Handle 809100 (sold separately). Great for fast and easy borders! 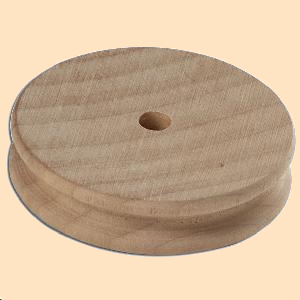 For use on cased vegetable tanned leather.1/4" wheels designed to fit Overstitch and Embossing Wheel Handle 809100 (sold separately). .
corners. 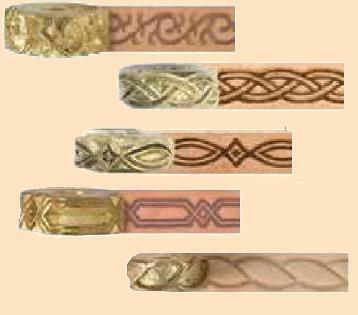 Offers you the choice of 5, 6, 7 or 8 stitches per inch (25 mm). second, press stitches to form a machine-sewn look. 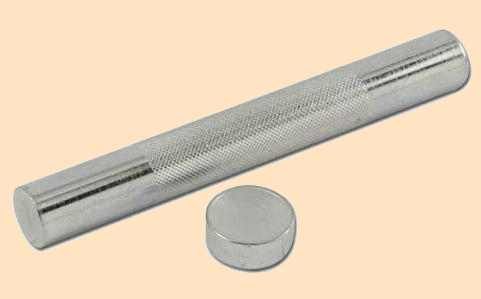 Available in 5, 6, 7 and 8 holes per 1" (25 mm). Used to mark patterns and scribe lines. 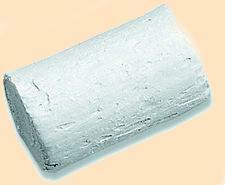 Used for filling cracks, edges, lacing and waxing thread. 1 oz. from 1/16" to 1-5/16" (2 to 33 mm). Deluxe set features a hardwood handle and four styles of interchangeable blades Includes two awl blades, one lacing fid blade and one scratch awl blade. Size #2 Awl Blade 2-3/8"
Size #3 Awl Blade 2-3/8"
in one step. Width adjusts from 1/16"
on your project, not just along the edge. blade. Make a clean groove from 1/16" to 1-3/8"
(2 to 35 mm) from edge. it so easy to push this sharp groover to create recessed lines for hand stitching. 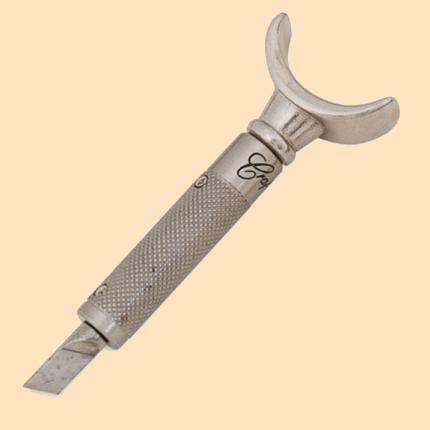 The blade and ferrule are stainless steel. Creates a U-shaped groove. any depth in seconds. Contoured wood handle. box-type handbags, briefcases and more. to control and handle. Die cast. 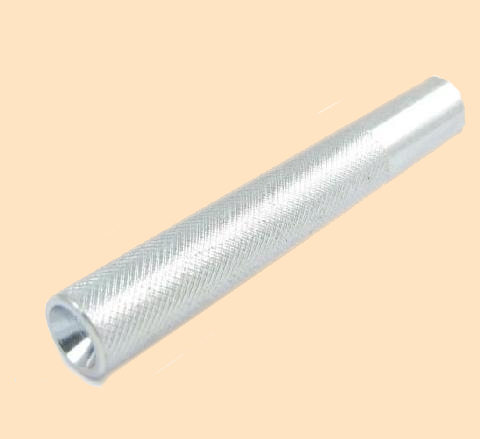 1-1/2" x 2-3/4" x 3/4"
(38 x 70 x 19 mm). fixed 1-1/4" (32 mm) blade. help you work your leather at the best angle. Made from forged steel, these quality blades will provide years of service. Insert into the haft above and you’re ready to go. well while providing a professional look. These are sharp and ready to use. look. 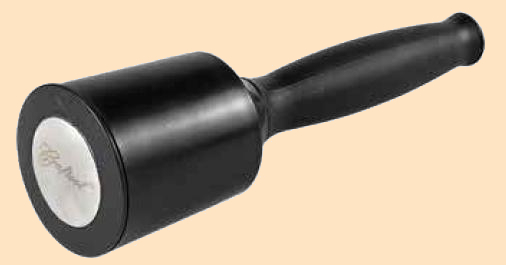 Tool length is 5-3/4" (146 mm). instruments. 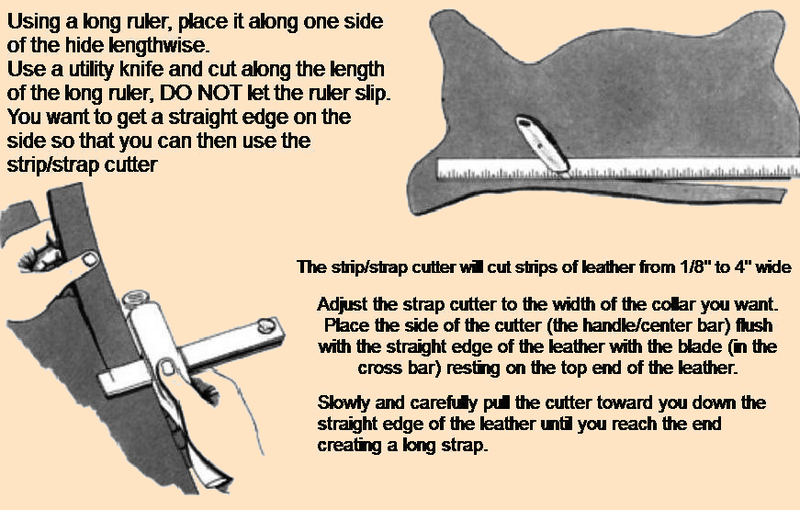 4" x 4" x 1-3/8"
leather and scratch cutting guidelines. leather to prevent scarring of your projects. can use both hands for lacing or sewing. to securely hold projects in its 3" (76 mm) grip. folds in leather during project construction. Use under Marble Slabs to absorb noise, or on top to protect your tool's cutting edges. 12" x 12" x 1/2". Protect the investment in your tools but using a high quality, impact absorbing surface underneath your leather while cutting or punching. 6" x 6" x 1/2". Protect the investment in your tools but using a high quality, impact absorbing surface underneath your leather while cutting or punching. Hand-forged, solid steel, known world wide for durability and performance. The only rotary punch you will ever need. 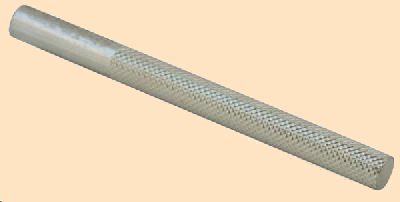 Includes tubes 0-1-2-3-4 and 6 in sizes 5/64" to 3/16". Punches 3/32" lacing holes in to leather up to 3 to 4 oz. 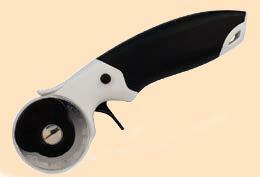 Features strong steel body, brass anvil, non-slip handle grips and adjustable, locking wheel. 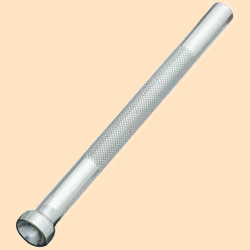 Threaded steel punch tubes can be replaced when damaged or dull (3798-10, -11, -12, -13, -14, -15, -16). Anyone that works with lightweight leather will want to add this unique tool to their workshop. 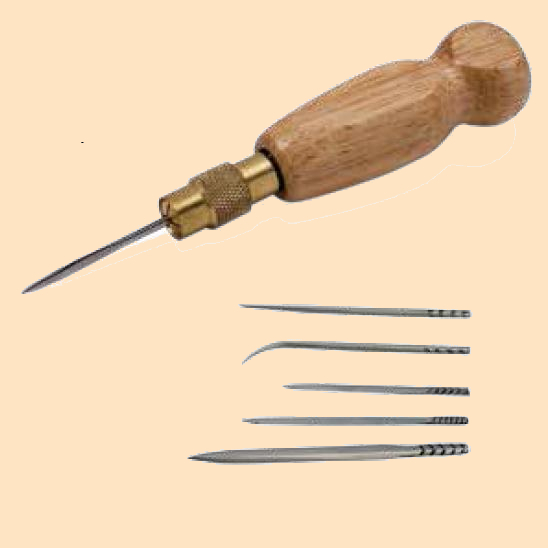 Punches clean holes every time in five different sizes in the thinnest of leathers. Recommended for leather thickness of 1/2 oz. to 5 oz. Our Best Seller for the budget minded! 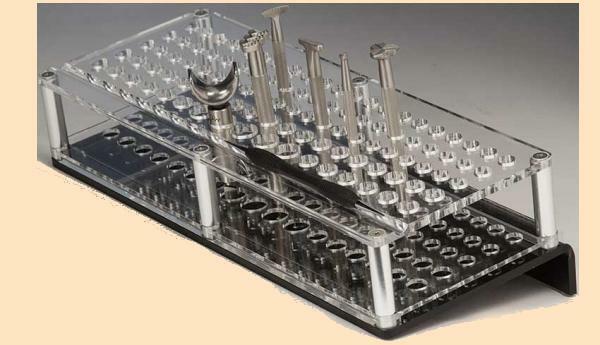 Pressed steel frame with six tubes that will fill most of your leathercraft needs at a price you can afford. Non-replaceable tubes. Pressed steel frame with replaceable size 00, 1/16" tube (323700). 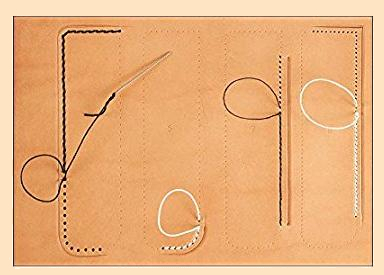 Punches holes in leather up to 6 oz. 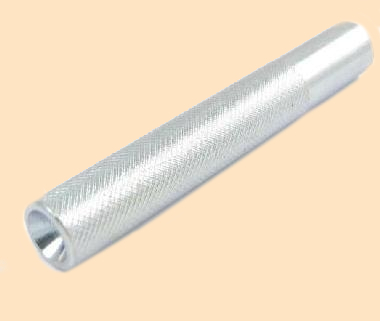 Extra tube size 00 (1/16") for Stitching Hole Spring Punch 3236-00. 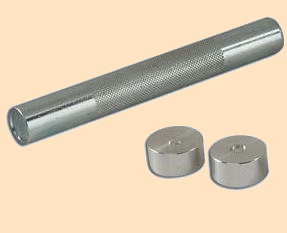 High quality, study sharp steel drive punches. One piece tool automatically cleans punched leather out the side of the barrel so there's never any clogging. Tubes are strong and durable. Sizes 0 through 5. 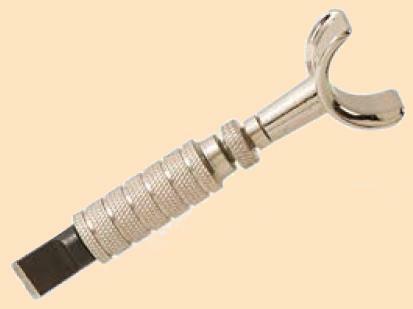 Each set includes six interchangeable tempered steel tubes and forged steel handle. 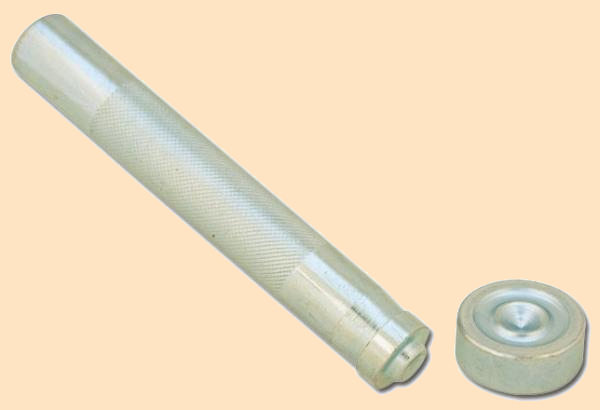 Larger tubes are used for grommets, eyelets, etc. 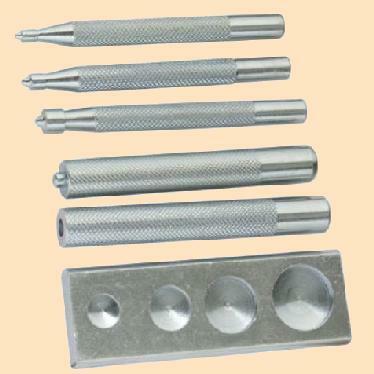 Includes sizes 6 through 10 and 12.
shaped punches with 3/32" (2 mm), 1/8" (3 mm) and 5/32" (4 mm) spacing. Tempered, interchangeable steel blades make punching lacing slits easy. 1/16", 3/32" and 1/8". For a symmetrical and totally finished look. 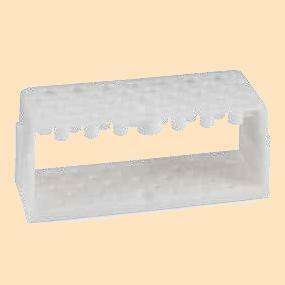 This punch will easily cut smooth, clean tips on all belts & straps up to 2" wide. 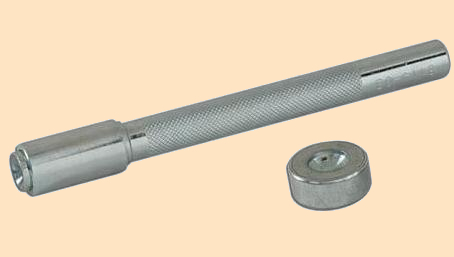 English Point Strap End Punches are hand forged with polished barrel and a tapered clearance. Used in the making of leather belts and straps. 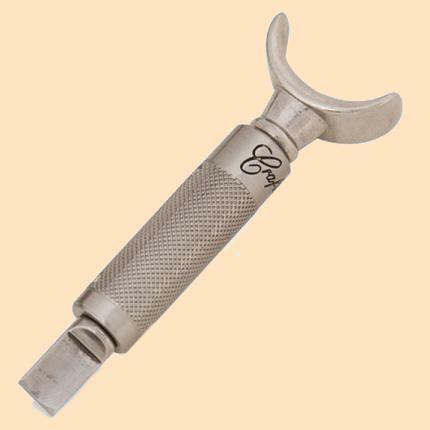 English Point Strap End Punches are hand forged with polished barrel and a tapered clearance. Used in the making of leather belts and straps. Hand-forged bag/oblong punches used by professional bag and strap manufactures. A must for any project that requires a buckle. Punches oblong hole approx. 1/2" long and 1/8" wide. A must for any project that requires a buckle. Punches oblong hole approx. 3/4" long and 1/8" wide. A must for any project that requires a buckle. Punches oblong hole approx. 1" long and 1/8" wide. Easy to mount to your work bench. 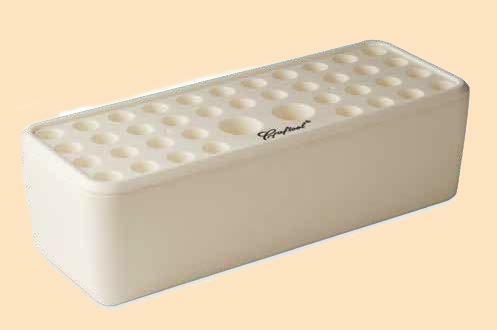 A great base for setting rivets. 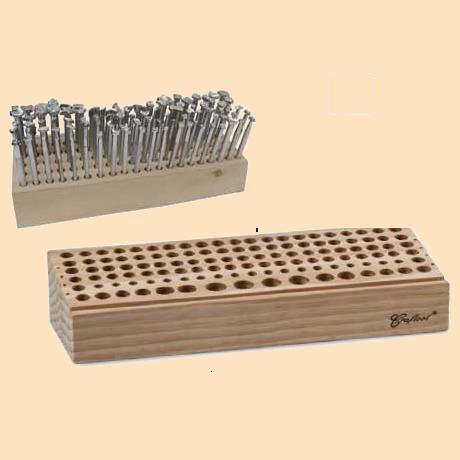 Sixty assorted rivets and two piece setting tool. Anvil for Line 20 & 24 Snaps. Precision made to set grommets easily. For rapid rivets or crystal rivets. 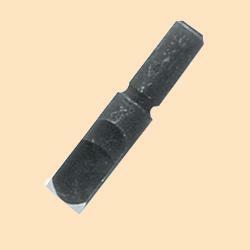 For use with extra-small rivets and #1385-02 Mini Rivets. #1375 Wide Double Cap Rivets. 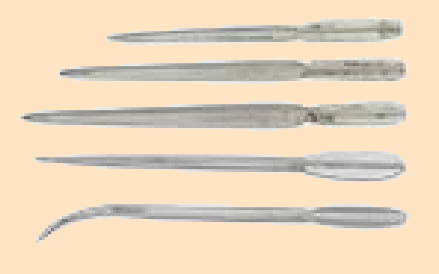 Four pieces for setting glove snaps and segma type snaps. Specially made for the proper setting of the stainless-steel Line 20/24 snaps. 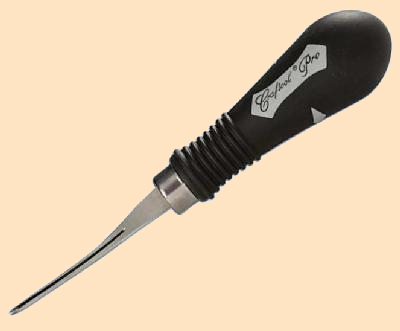 Two different sizes of interchangeable setting tips screw into included handle. Works best when used with #8056-00 Anvil. This is the best universal snap and rivet setter offered anywhere. 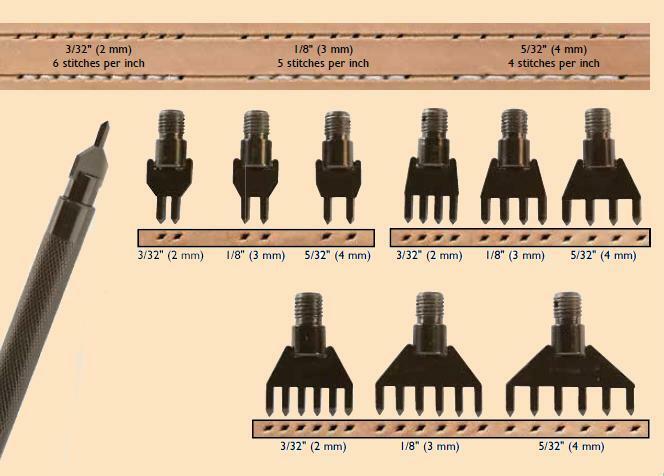 Sets Multi Purpose Segma Type Fasteners 1250, Line 20 Fasteners 1261 (baby dot snaps), Line 24 Fasteners 1263 (Durable Dot Snaps), Rapid Rivets and Double Cap Rivets. Snaps (not for use on stainless-steel snaps). Sets 9 (thick) copper rivets. Base for setting 1309-00 Sam Browne Button studs. For properly setting #1330 Round Spots. Use to properly set #1299-20 and #1299-21 Magnetic Bag Clasps. 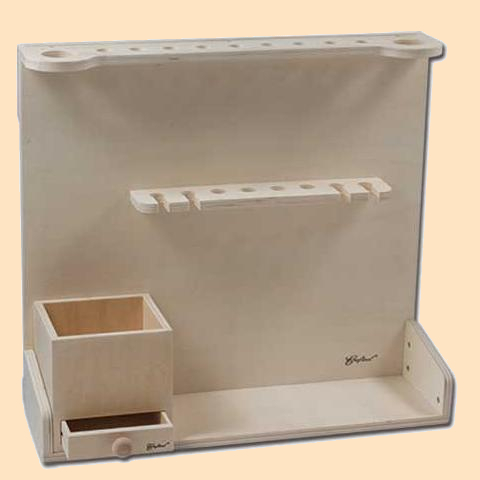 Grooved upper edge to hold pencils or modeling tools. Five large holes for swivel knives and other big tools. Holds 36 stamping tools and a swivel knife. and protects your tools edges. the base of the rack to prevent slipping on surfaces. 3-3/8" x 8-3/4" x 2-1/2" (89 x 213 x 64 mm). your tools. Offers ninety-nine assorted sized holes. pens and modeling tools in easy reach. It’s a very sturdy and stylish rack. Some minor assembly required. 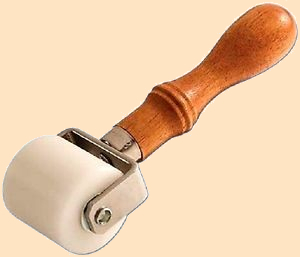 Top measures 13-1/2" x 5-1/2" Height is 2-1/2" to 3-1/2"
Craftool® stamps and swivel knife sold separately. This durable plastic racks from Craftool®. that hold Mini 3D stamps and four holes for stamp handles. Tracing Film ~ Re-useable film for transferring designs and patterns onto leather.